A few months ago, PS2G met the Colombianitos.org Team and kids from Puerto Tejada (Colombia). They have grown a lot in the area and have 5 sites and close to 1,000 kids in all their programs. Their commitment and love is contagious! Puerto Tejada is a small town south of Cali (third biggest city in Colombia) where families live mainly from sugar cane and other jobs at industries located in the area or domestic service jobs in the city. It is also home of salsa dancers, soccer players and children with big smiles, and, unfortunately, it is also home of gangs, poverty and extreme violence. Children experience invisible borders that limit their interactions with other children from neighboring areas. When Colombianitos started working at El Barrio, gangs would have at least one violent encounter per day. I met Antonia, the head of Colombianitos at Puerto Tejada. She is a local leader with a vision and big heart for her people. Antonia told me about the challenges and accomplishments of their work in the area. When the program arrived to El Barrio, their office was robbed, coaches were threatened and a few of her staff resigned. It was very difficult to do the work but the need was pressing and kids were extremely excited to be part of Colombianitos. 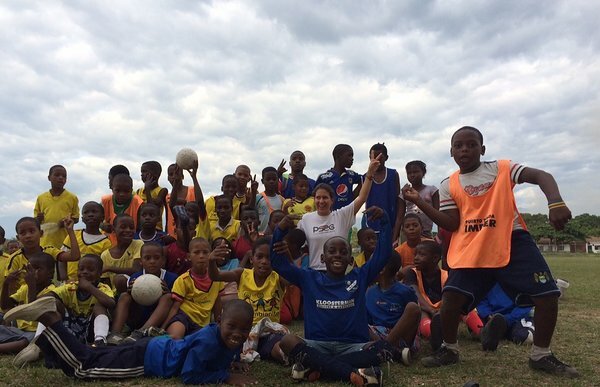 So the team decided to connect with the gangs and invited them to a tournament following soccer for peace rules. They hosted it at a neutral field, right next to the police station. The air was tense but for a number of days they hosted games where gangs were able to interact, for the first time, in peace. Since then, gangs respect and protect the program and a tournament is hosted every year! During my visit I met some of the coaches and leaders. 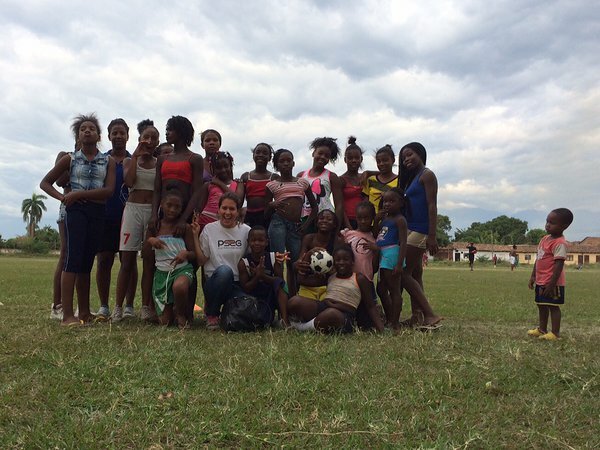 Mercedes is a young woman and a proud Colombianitos graduate who now leads the girls´ soccer program. She is a young girl with big dreams. After finishing HS, she got a certificate (similar to an Associate Degree in the USA) in sports education. She would love to attend college and continue to support the kids from Puerto Tejada. She thinks, Colombianitos is the only consistent and safe space for children to be children and to have a life path away from violence. Hamilton is a teenager, goal keeper and now young leader at Colombianitos. He says that Colombianitos has helped him to do well in school, to be able relate to others and communicate well. He wants to be a soccer player or, in case he doesn´t make it, he wants to be a Physical Education teacher in his community. Before I left the soccer field I asked the kids to tell me, using only one word, what Colombianitos meant for them. They said: Soccer! Group! Team! and future!!! PS2G donated soccer shoes and first aid kits to a site in Puerto Tejada called El Barrio during our visit in August and is proud to continue supporting Colombianitos through our local soccer meetups and bringing awareness to this positive cause.